Carl Deuker's Official Website - Payback Time--Trailers made for the book by readers. THANK YOU ONE AND ALL! Payback Time--Trailers made for the book by readers. THANK YOU ONE AND ALL! From the moment I picked up Payback Time I couldn't put it down. Payback Time is a fantastic book that allows its readers to relate to the protagonist in a number of different ways. Including his demeanor and struggles with weight and recognizing what he wants to do in his life. And it is through these struggles that we are able to see the protagonist, Mitch, grow. 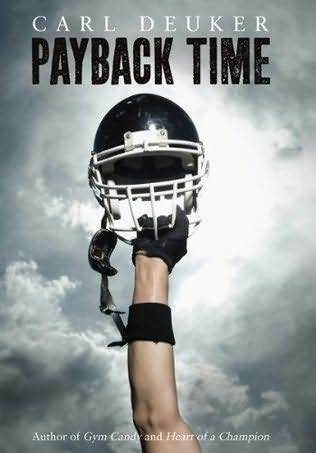 Payback Time is an interesting mixture of a young adult, sports, and mystery novel. It is this unique combination that allows Deuker to completely capture the audience's attention. Whenever the story starts to slow down readers will be swept up into an action packed description of a fourth and out play that Mitch is reporting on, bringing a fresh sense to the book and reviving this adrenaline charged book. But the real excitement of the story is centered around Mitch, the protagonist, snooping around Angel, the mysterious football player who seems to old and is sensational, yet downplays how good he on the field. Angel's past slowly unfurls in front of Mitch, but when the mystery is solved, and the worst happens, it's up to Mitch to see what kind of person he really is and try to help fix the problem that he created. While most authors would flounder about with this kind crisis, and try to have the character make decisions that don't make any sense or have them have unrealistic conclusions. Deuker's characters are true and accurate. And it is through his sensational character development that he is able to show the change that Mitch makes, allowing his conclusion to really end with a bang. Between the exciting football games, the unfolding mystery of Angel, and Deuker's engrossing characters this is a great book. I personally couldn't put it down, and I would recommend it to fans of young adult sports books, mysteries, and anyone just looking for a good book. As a Middle School teacher of thirty years, I would rate this book as five stars. The reading level is on target, the characters are true to life, plus there is lots of football to keep reluctant readers involved. The violence is acceptable for most students. This book earned the Maryland Blackeyed Susan award and in my school was voted best new book by our sixth, seventh, and eighth grade boys. To buy Payback Time, please click here.